Partying is an important component of our lives. It could be a wedding party, birthday, farewell, etc. Icons such as Wedding Icons plays a significant role when it comes to web or graphic designs . Today, we have the pleasure to share with you this striking collection of awesome party icons, which we believe you are going to find very handy for creating a high-quality party or celebration-inspired design projects. This set featuring icons of the items commonly found in a typical birthday party such as cake, fireworks, candles, etc, can be all that you need to give your birthday-inspired artwork design a real birthday celebrations look. These vector icons are available for download as EPS file. If your celebrations-related design project has a beach theme, then you will find this set of colorful icons really useful. The icons featured includes an umbrella, sunglasses, ball, coconut, etc, all of which are items commonly associated with beach partying. Want to give your partying-related design projects a vintage touch of elegance? Then, this set featuring retro-styled icon could be all that you need. The pack featuring balloons, fireworks, cake, candles, drink glasses, etc, comes with fantastic high resolution. These black icons set featuring popular partying icons like balloons, music, glasses, etc, can spice up your birthday, Christmas or New Year party creative work a great deal. You can use them on your invitations or flyers. This pack of sixteen icons looks so elegant that you won’t help but use them in your party-inspired design work. Available in Photoshop EPS file format, these icons are fully editable to enable you to come with your own icons style. 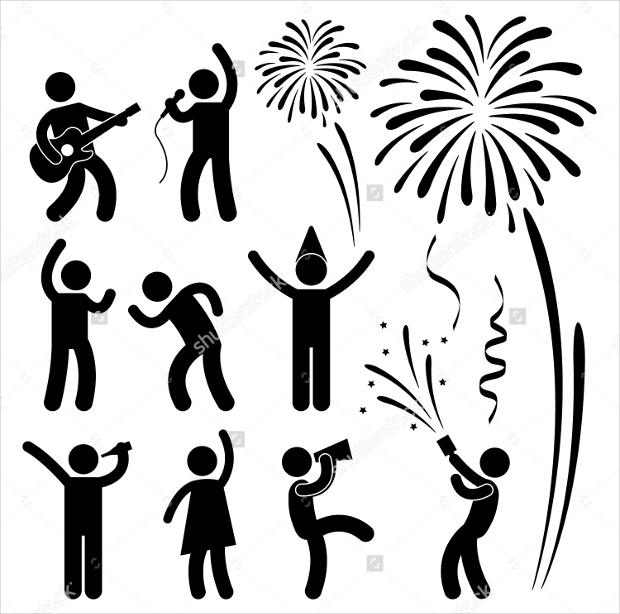 Featuring popular partying icons including music, balloon, cake, drink, glass and more, these icons are just perfect for your assorted party related artistic projects. These vector icons are fully scalable and easily editable and are available in an impressive resolution. This is definitely a large collection of party and celebrations related icons. These vector icons are available in layered SVG and ready-to-use PNG file formats. You can change the color or the shapes of these icons with ease. Besides, you can resize the vector icons to your desirable size with much ease. This set features virtually all the symbols and icons popular with holiday and party celebrations including July 4th, Easter, Valentines, etc. You can use these icons in your web design, apps, greeting cards, etc. They are available in layered PSD file format. The colorful cocktail icons featured in this set looks awe-inspiring, an attribute that makes them ideal for use in all your creative work related to party celebrations. The icons are available in Vector EPS file, which can be edited with much ease. Featuring popular party icons like music, guitar, glass, balloon, cocktail, etc, this could be the perfect set of icons to use in your party-inspired web or graphic design projects. You can get this awesome set in JPG, EPS and AI formats. Vector Black Party Icon Set. Definitely, incorporating these awesome party icons in your designing toolkit will prove to be very gratifying. Now, fulfill those joyous moments of partying with these distinct icons. Whether it is the Fruit Icons or sweet icons that you would like to use in your party-related artistic work, you will find the above great collection of icons very helpful.